Despite equities seeing rather significant downside, the VIX remained relatively subdued across the day, settling +10.8% @ 16.69 (intra high 16.91). Near term outlook is that VIX has maxed out around resistance, and looks set to cool into the weekend. A day of big equity declines, but which were not particularly reflected in the VIX... much like Friday. VIX is probably close to maxing out.. if not already, and looks set to cool lower into the weekend, not least if the market can rally/bounce into the sp'2070/80s. The key VIX 20 threshold looks out of range in the current up wave. 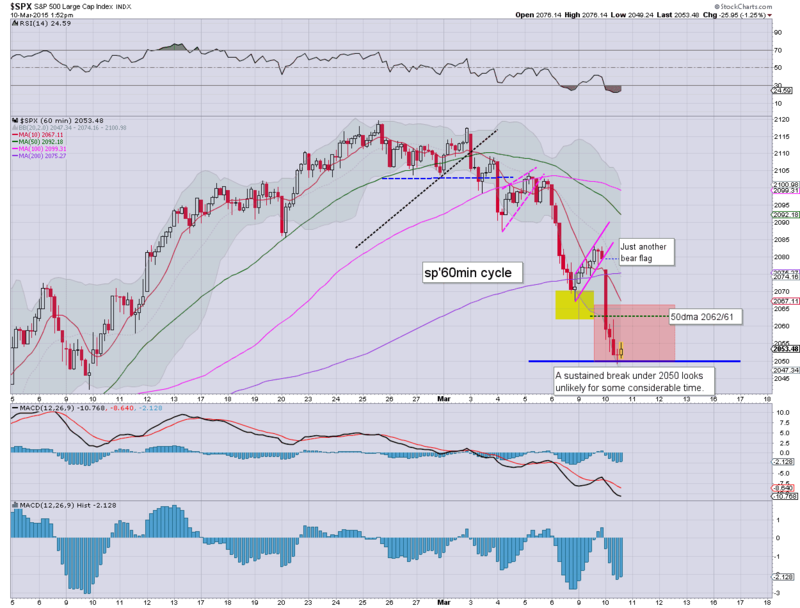 US equities closed broadly weak, sp -35pts @ 2044. The two leaders - Trans/R2K, settled lower by -1.4% and -1.2% respectively. Near term outlook is offering a key floor... with renewed upside into next week's FOMC. *closing price action was pretty weak.. with another fractional lower low of sp'2044, but overall... the market is likely in the process of flooring. 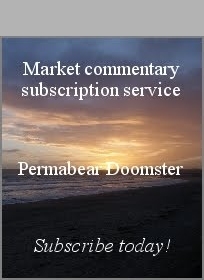 ... the second significant decline in three days... although as I've noted across the day, the VIX has remained relatively subdued... and is NOT confirming any real market concern. Something of note... we're now just 2% away from the uber-critical 200dma. Only with a break <2k, would the bigger trends start to be in danger of turning. 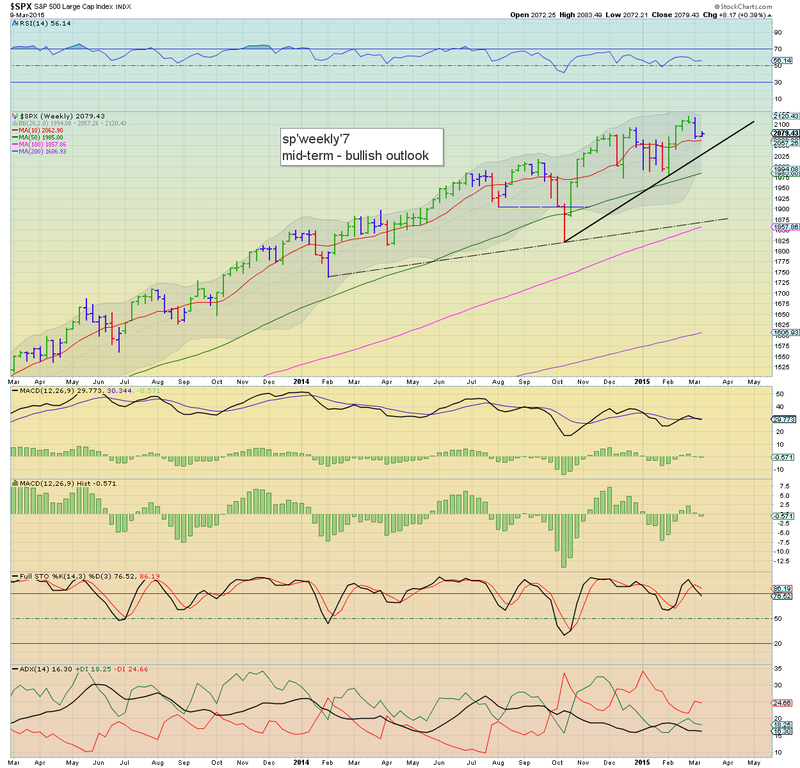 As it is.. we still have a lot March to trade through.. and as ever... it won't take much to launch another wave higher. The Yellen is due to make an appearence next week... bears... beware! It remains a tough battle in market land with a fractionally lower low of sp'2048.30.. although the VIX is not confirming the move via a new high. A closing hour mini ramp is viable... into the sp'2060s. 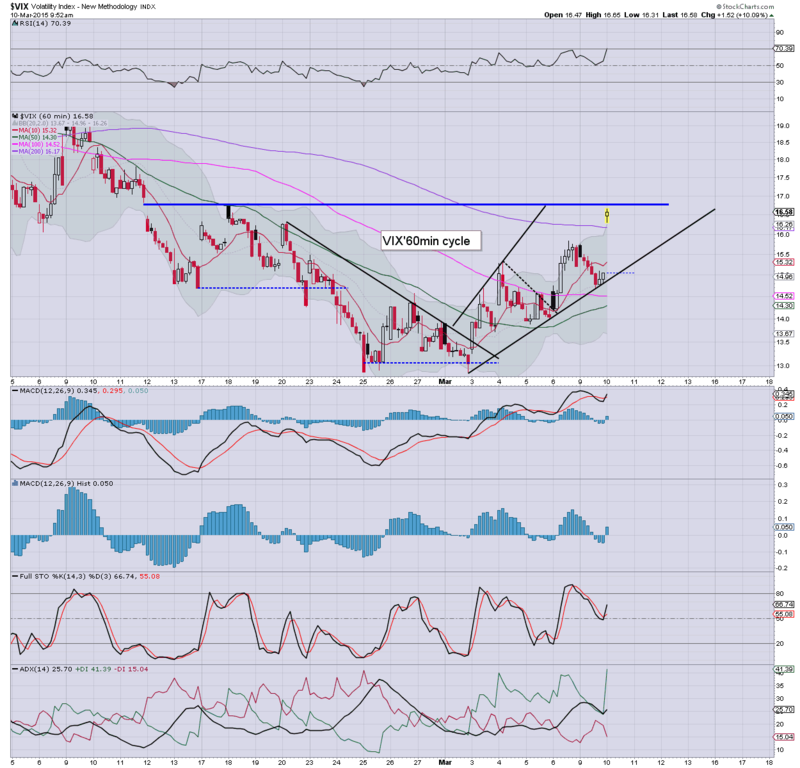 Metals remain broadly weak, Gold -$5. Oil is trying to floor, -2.7%. So... an hour left.. on what has been a more bearish day than even I was looking for (original target was 2065/60). 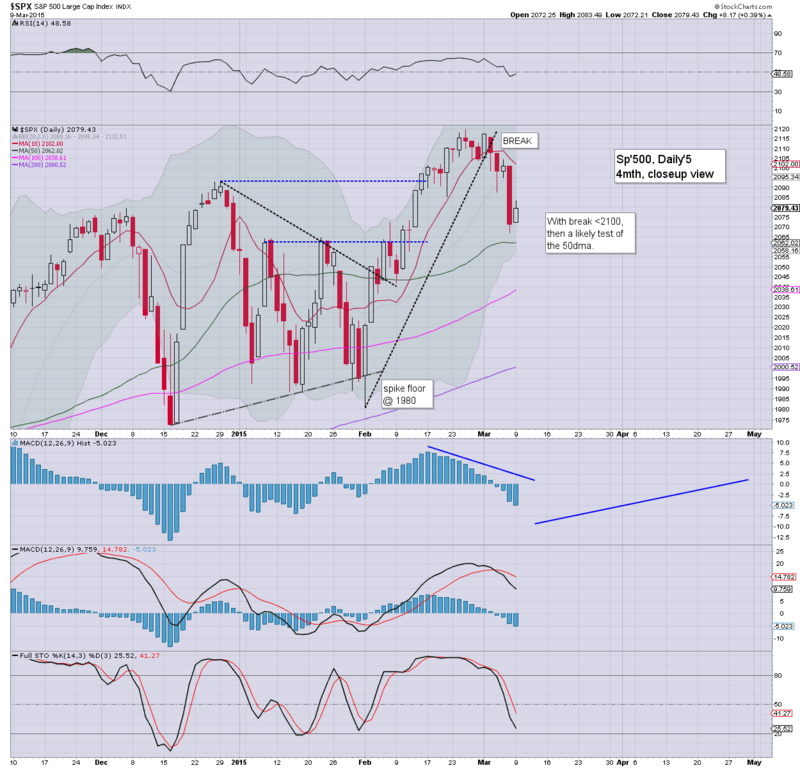 There remains VERY high threat of a closing hour ramp.. even as high as the low 2060s.. where the 50dma is lurking. On any basis, hourly equity/VIX cycles are set to turn... and now its a case of whether the bulls can break the down trend from sp'2119. It won't take much... anything >2065/70 will break trend. 3.15pm.. Ironically.. its getting a little tedious, even though the market is sp -29pts ! Hourly cycles still look set to turn higher.. and more than anything right now, it would bemuse me why any of the bears would remain short overnight. 3.35pm... Market still stuck around 2050... with VIX 16.40s. Today has unquestionably been a day for the bears... but who wants to hold short overnight? Market appears still in the early phase of building a floor from the earlier low of sp'2049. VIX looks stuck around key resistance in the mid 16s. Metals remain weak, Gold -$5. Oil continues to slide, -3.0% in the $48s. *metals sure look weak... and a break under the $1130 low looks viable at ANY point. The miners will naturally be dragged lower into the black hole.. as Gold bugs are set to be broken to the giant $1000 threshold. Equity bears have NO excuses for complaints later this week if we're back in the 2070/80s..along with VIX 15/14s. There have been ample opportunites to exit/re-position today. 2.24pm.. Fractional new lows in the indexes.... VIX not confirming the move. Typical turn time is 2.30pm..... bulls need to make an appearence in the remaining 90mins. Notable weakness, Oil, -3.2% in the low $48s... that is causing all sorts of problems for energy stocks. US equities break another new intra low.. to sp'2049.. with VIX 16.91. The declines are 'interesting'.. but hourly cycles are set to turn upward into the close... with viable upside across Wed/Thursday. Metals remain broadly weak. Gold -$6.. set to break a multi-year low (<$1130) in the days ahead. Interesting declines, but overall... today very likely makes for a cycle low.. along with a VIX high. 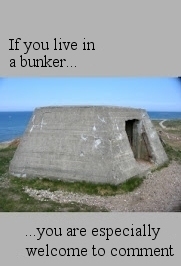 Unlike some.. I do not see sp'2k within range... nor VIX 20s. US equities remain broadly weak, with an intra low of sp'2052.. along with VIX 16.65. Hourly index/VIX cycles are set for a clear turn into the afternoon. Market is likely in a floor building process that will occupy the rest of the day. Metals have turned lower, Gold -$2. Oil remains weak -1.4%. *eyes on the VIX.. unless it can break a new daily high... it is STILL indicating the market is building a floor. 12.02pm... VIX breaks a new intra high ... yes.. I'm surprised... along with sp'2050. 12.14pm.. Viable spike-floor on the sp' from 2049.... bears arguably getting a bonus opportunity to exit... and/or to go long. We have an interesting afternoon ahead! We're at the typical turn/floor time of 11am.... lets see what the bull maniacs can manage into the early afternoon. To me, the VIX is a major warning that the market is in a flooring process... but I realise a fair few bears would vehemently argue against that! 11.16am... market battling upward.. sp'2060... VIX about to lose the 16s. Its looking pretty conclusive.... a daily close back above the 50dma of sp'2061 will be 'useful' to those who went long this morning. 11.40am.. Market still battling to build a floor. Hourly cycle will be offering a clear turn by this afternoon. Most notable remains VIX... unable to break a new high. 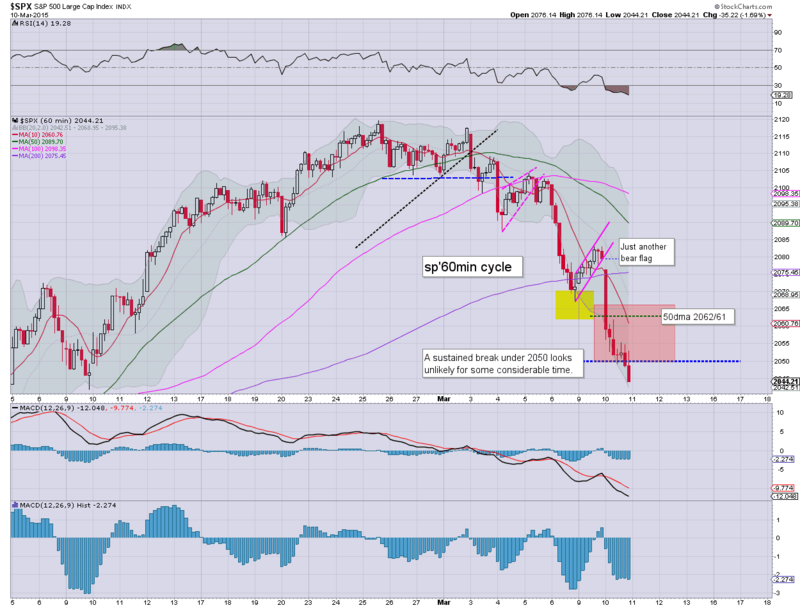 US equities open sharply lower, with a marginal break of the 50dma.. into the 2050s. However, the VIX is still relatively subdued, and does not support the notion of a much grander down wave. Metals are seeing a minor 'fear bid' with Gold +$3. Oil remains broadly weak, -1.4%. 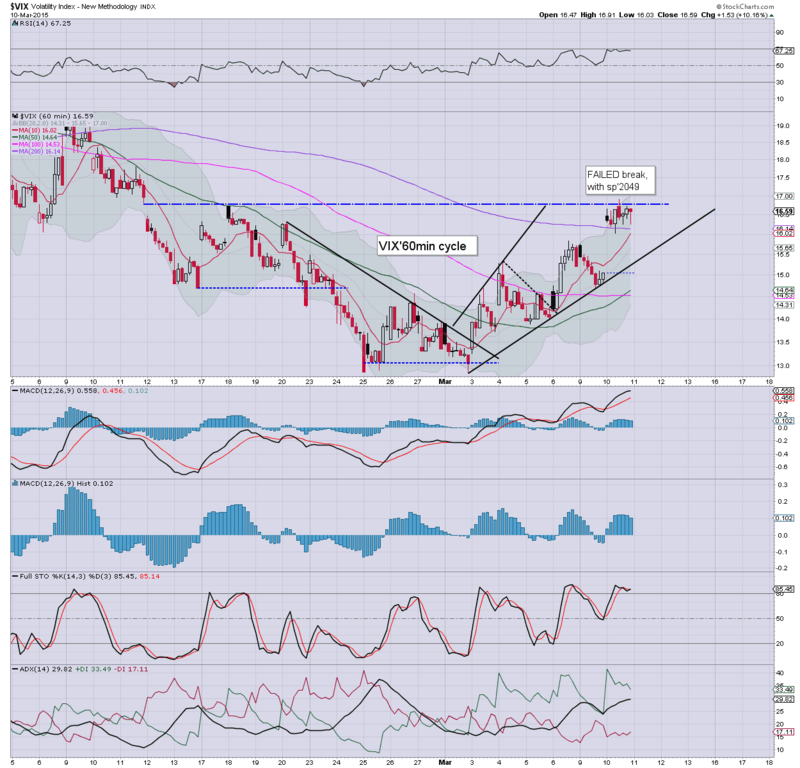 *the opening hourly candle on the VIX is flipping between a black-fail.. and moderately bullish. Overall though... I think VIX is maxed out. 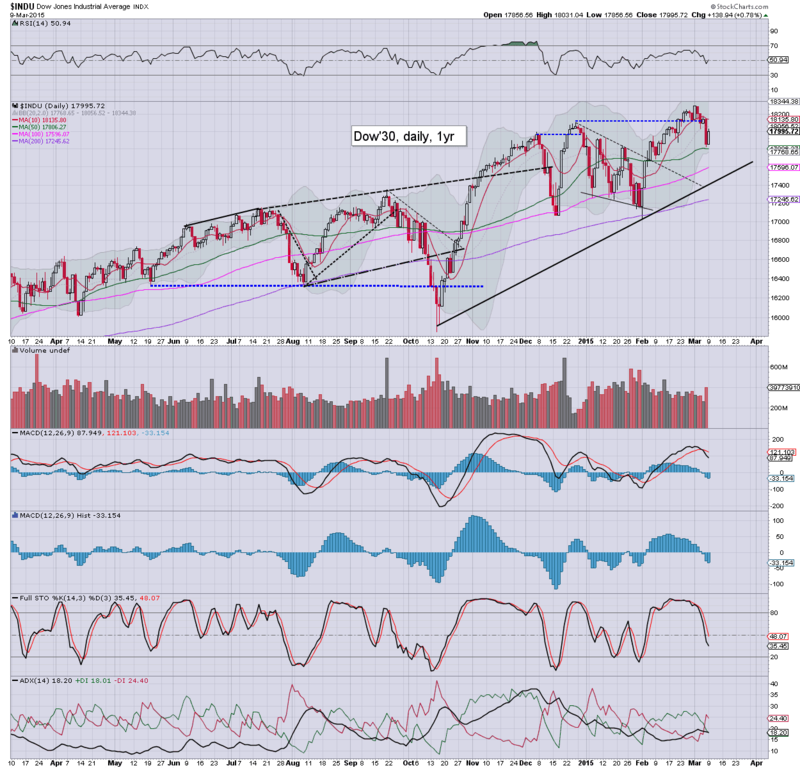 So... it WAS a bear flag.. as I was droning on about during yesterday. 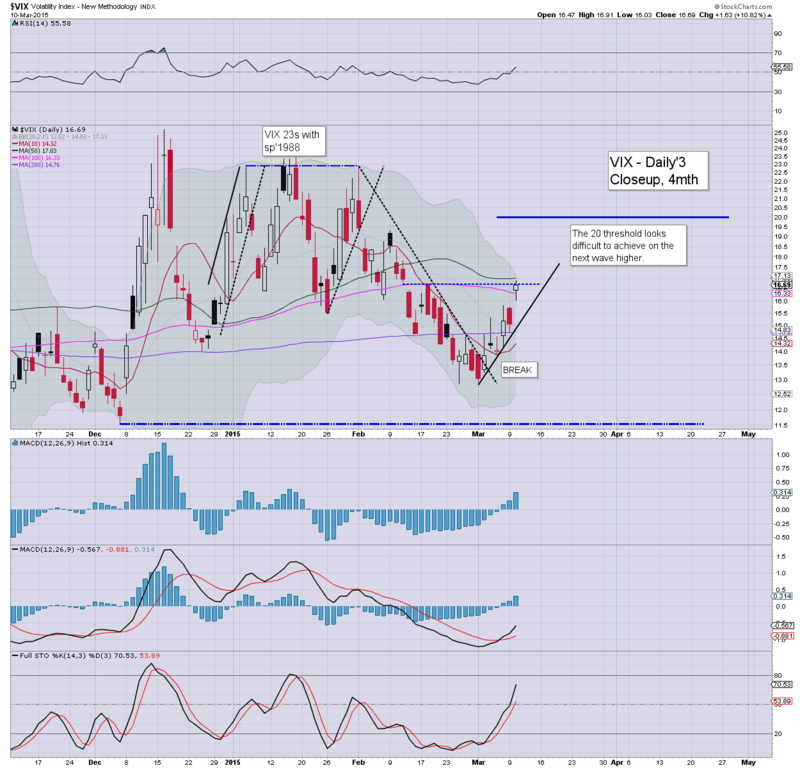 VIX has jumped higher.. and is offering a black-fail candle at the open.. which does NOT favour the bears. From a wave count.. we have 5 clear waves down.. and this decline from sp'2119.. is likely complete. Certainly.. a turn by 11am is VERY probable. It does NOT favour the bears.... the equity down wave from 2119 is almost certainly complete. 10.07am.. VIX cooling.... equities building a floor. 10.18am.. Marginal new equity low.. but VIX is NOT confirming the move. 10.33am VIX still failing to break higher.... stuck under key resistance. The clock is ticking... bears running out of time.... typical turn/floor time 11am or so. 10.39am... HEAVY action in AAPL, -1.9%.... incredible amount of trades flying through... someone hit the big sell button on that one. Meanwhile.. VIX still holding under the opening high. 10.49am... I realise some will be pretty bearish right now.. but VIX is NOT confirming it... and remains stuck. Market is arguably still in early phase of building a floor. Good morning. Futures are sharply lower, sp -20pts, we're set to open at a new cycle low of 2059. Metals are seeing a minor bounce, Gold +$2. Oil is weak, -0.7%. Hello! Well. I was looking for a negative open. but not of this degree. Things are getting somewhat interesting. However... it is important not to get lost in any bearish hysteria.. right? Why the decline? Rising USD is not helping... almost near the 100 level. 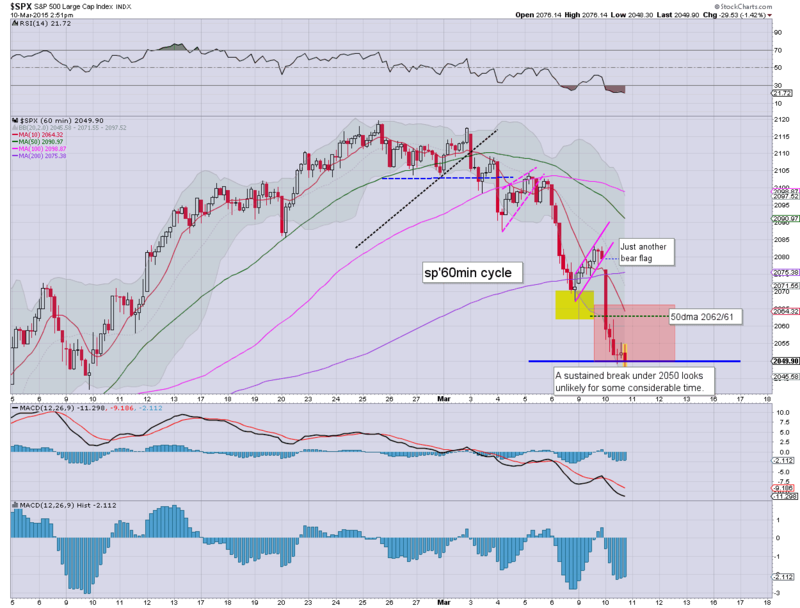 Target was the sp'2065/60 zone, and we're likely to undercut that at the open. Typically, we'll floor around 11am... so... a washout until then seems likely. Bears should be VERY mindful of an opening black-fail hourly candle on the VIX... especially one in the 16.50/17.00 zone. Right now, the 18s look out of range. 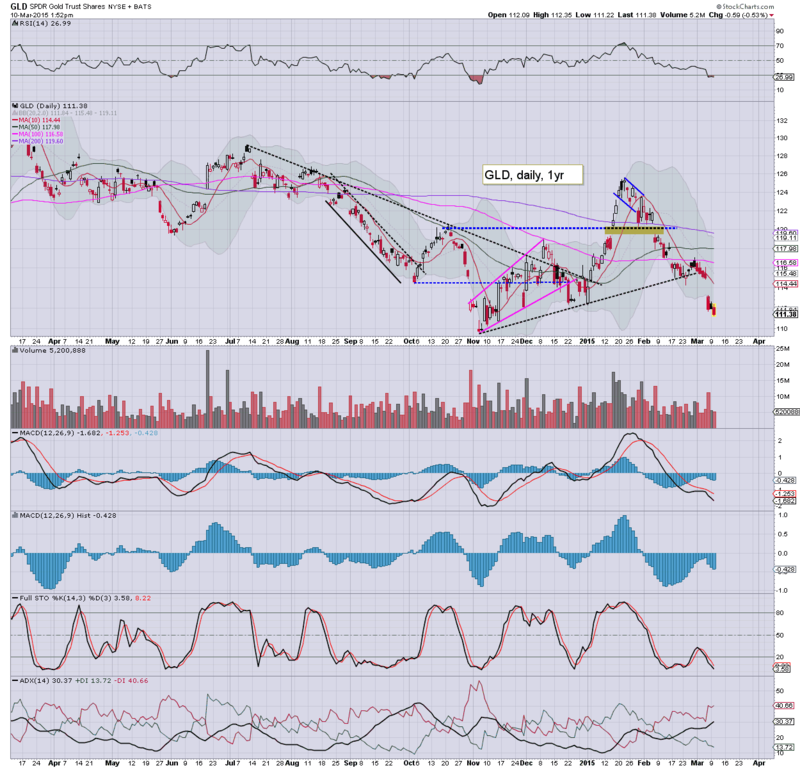 Notable weakness: oil/gas drillers, RIG -2%, SDRL -3%.... energy names remain in real trouble. INTC, -1.7%... particularly weak of late, but still.... unquestionably one of the finest tech stocks. 9am sp-18pts... so that is 2061... where the 50dma is. *Cramer set to open the market.... clearly... the end of times has begun. 9.13am sp -15pts... 2064.... there is clearly some support at current levels. Eyes to the VIX... at the open. 9.32am... Cramer rings... and the market sinks.... 50dma being tested. 9.34am.. BLACK-fail candle on the hourly VIX..... bears.............. beware! 9.38am... VIX black candle holding.. despite equities @ 2060. Bears have a real problem here... from a cyclical/wave perspective. 9.44am.. Black-fail candle STILL on the VIX.. just below key resistance. VIX is likely maxed out.. on this multi-day cycle. 9.48am.. VIX candle turns marginally bullish.. but still.... it looks vulnerable... not least via the equity 5 wave count... which remains pretty clear. .. another micro wave lower... 2056.... Hmmm VIX still holding below gap resistance. US equities managed to hold moderate gains into the Monday close, but another minor wave lower looks due across Tue/Wed... to the sp'2065/60 zone. From there... renewed upside into end month... and probably across April to the 2125/75 zone. *the second consecutive blue candle... and I'm guessing we'll floor somewhere in the low sp'2060s by midweek. Frankly... a pretty tiresome day. A bounce is all that today was.. much like last Wed/Thursday. Tuesday may well open a little higher.. but we'll surely close red.. the only issue is whether it'll take until Wed' to hit the target zone of sp'2065/60 - where there are multiple aspects of support. The only data of note is Wholesale trade, but.. most don't give much significance to that these days. For those with an interest in the bigger economic picture - along with related societal implications, its pretty informative. Market looks set for another minor wave lower... before resuming the broader upward trend.